Mardi Gras celebrations are already breaking out this year in New Orleans. Today, schools are closing early so everyone can get to the Louisiana Superdome in time for tonight's Super Bowl parade. And still celebrating the Saints' championship is a pair of CNN political contributors who happen to be husband and wife and members of the "Who dat" nation – James Carville and Mary Matalin. They joined us on Tuesday's American Morning. Michael Jackson's doctor is free on bail today. According to his lawyer, Conrad Murray is ready to resume practicing medicine. Murray is charged with involuntary manslaughter in connection with Jackson's death. Yesterday, he pleaded not guilty as Jackson's family looked on. Our Ted Rowlands was there and has this report. 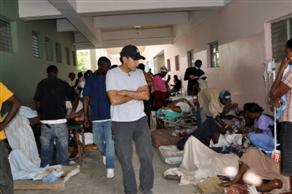 Dr. Sanjay Gupta in Port-au-Prince hospital. When I told my wife I wanted to go back to Haiti, she had the reaction I expected. “The girls really missed you when you were gone last time,” she said. “I am worried that you lost too much weight down there,” she added. And, “what about your safety, physical and mental well being?” she concluded. They were all the reactions I expected. I thought about that conversation a lot on the middle-of-the-night flight to Florida, a connection to Santa Domingo at 3 a.m. and then finally the early morning arrival in Port-au-Prince. She has seen the images on television of the unfathomable suffering over the last month, and she was affected by it in more ways that I realized. Over the few days I was home, we hardly talked about what I had seen in Haiti. I felt the need to protect her from those stories, some of which I may never share with anyone – and she was cognizant of the desire to not re open the emotional images. She also knew that while I was physically home, my mind never left Haiti. Was medical error to blame for Rep. Murtha's death? Pennsylvania Democratic Congressman John Murtha died suddenly yesterday after complications from galbladder surgery. Now many are asking what went wrong? Our senior medical correspondent Elizabeth Cohen explains. Runways ready for more snow to freeze flights across U.S.
More heavy snow is moving in from the Midwest to the Mid-Atlantic states. And travel problems still haven't cleared up from the weekend when parts of the D.C. area got 30 inches. Some people are wondering if they'll get out this week. Our Sarah Lee reports from Reagan National Airport with a look at how things are moving. Editor's Note: From the home front to the front lines, we're following one recruit's journey in our American Morning original series "A Soldier's Story." Today, in part five, Jason Carroll reports on the critical weapons training our recruit Will McLain needs to survive on the battlefield. For privates like Will McLain, the stress is not just about passing a weapons test. It’s also about coming closer to learning whether or not he will be deployed to fight a war. It is one of the last hurdles to overcome before completing basic training – weapons qualification. Before Will McLain enlisted, he showed me how to handle a shotgun back in his hometown of Rosamond, California. But shooting for recreation is nothing compared to what he’s doing now, where hitting bulls-eyes is just as important as avoiding sniper fire. Will's shooting scores earned him a rating of marksman, but fell short of the score needed for sharpshooter or expert. I asked him if there were times he thought he couldn’t do it.